Incised signature “Dorian Sands” to unglazed base. Small wheel thrown bowl with tab handle impressed with a sunburst/starfish design to top of handle. Thomas Percy Sanders was born on the 16th of February 1924. Others record his birth in 1921 or 1925, but it was actually 1924. 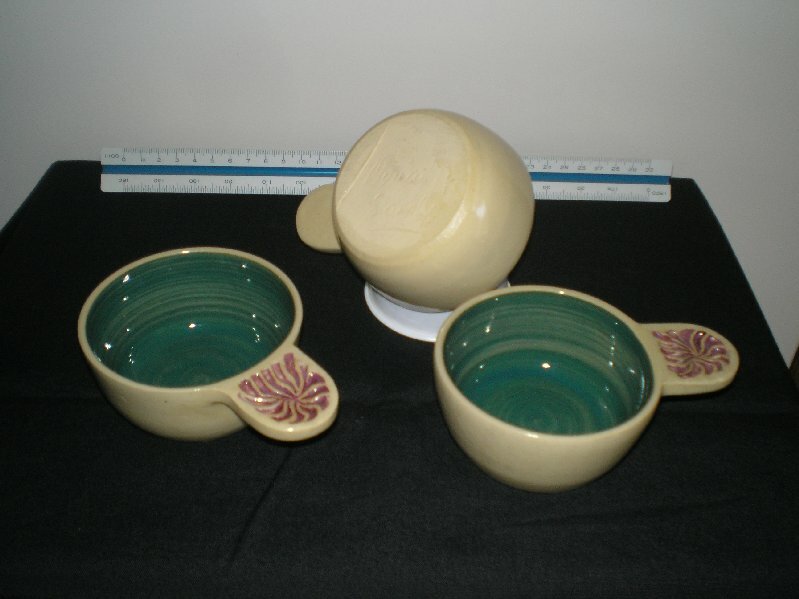 After serving in the Royal Australian Air Force as an Aircraftsman in WW2, Tom moved north from Melbourne and started working in Guy Boyd's Sydney pottery as a potter and ceramic decorator. He moved back to Melbourne in 1949 and worked at the Hoffmann pottery in East Brunswick. He spent a year with Arthur Boyd at Murrumbeena in suburban Melbourne before setting up his own pottery "T & E Sanders" at Eltham in 1950. Following the establishment of Montsalvat in 1934, Eltham was becoming a centre for what was later to be called the alternative lifestyle. Tom produced these pieces decorated with a sunburst/starfish pattern to the top of the tab handles with the name "Dorian Sands", incised to the base. You can see the wire mark where he removed them from the wheel. His work is said to have been influenced by Guy Boyd and John Perceval. I tend to think that his skill as a potter and artist probably influenced them. Tom was part of that talented group of artists who moved to London in the late 1950s eg: Sydney Nolan, Arthur Boyd, Charles Blackman Brett Whitely and Barry Humphries. 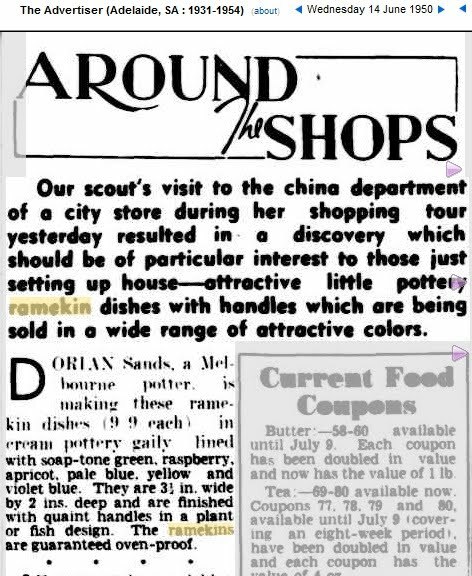 There is an advertisement for his ramekins in South Australia in 1950. In 1964, a black and white 16mm film entitled “The Lively Arts” featured Tom. Using his pseudonym Dorian Sands, he also produced a series of sgraffito decorated zodiac inspired ramekins. They can be costly so if you find one, buy it. From 1969 until 1971, Tom and John Olsen completed a large ceramic mural entitled “Eastern World” at the University of Melbourne in the courtyard of the Physics Building. Tom's son, Christopher Sanders was born in Melbourne in 1952. He started working in his father’s pottery at Eltham in 1972 and continues working today. Yet another example of following in father's footsteps. The start of Christopher’s career coincided with Tom’s serious illness and Tom stopped working until 1980. Some of the ramekins incised "Dorian Sands" are very similar in design to those of Arthur Boyd, so he obviously used some of the designs when he moved to Eltham. As well as ceramics, Tom was also a designer whose work was reproduced in prints as well as tapestry. He also made blanks that were decorated by artist John Olsen. Examples are in the Powerhouse Museum. I have some ramekins with the starburst design on the under side of the handle. The ramekins are decorated with a design similar to Australian Aboriginal art. They are marked underneath with a large "S". They were given to me by my great Aunt who said they were valuable. Would they be Dorian Sands? Without seeing them it is hard to judge. Many makers used faux aboriginal designs way back when. 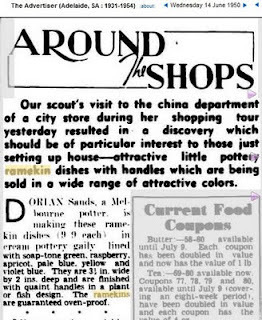 The phrase valuable ramekins to me is a redundant tautology, although some of the prices being asked on internet auction sites may contradict this. Tom Sanders once worked at Boyds pottery in Sydney and marked some of their pieces with his initials "TS". If you can send a picture, it would help.